I sat down Friday afternoon with Rich P Evolon — who endorsed my candidacy for city council in the February primary — at Rumberger’s on Main Street in the River City. 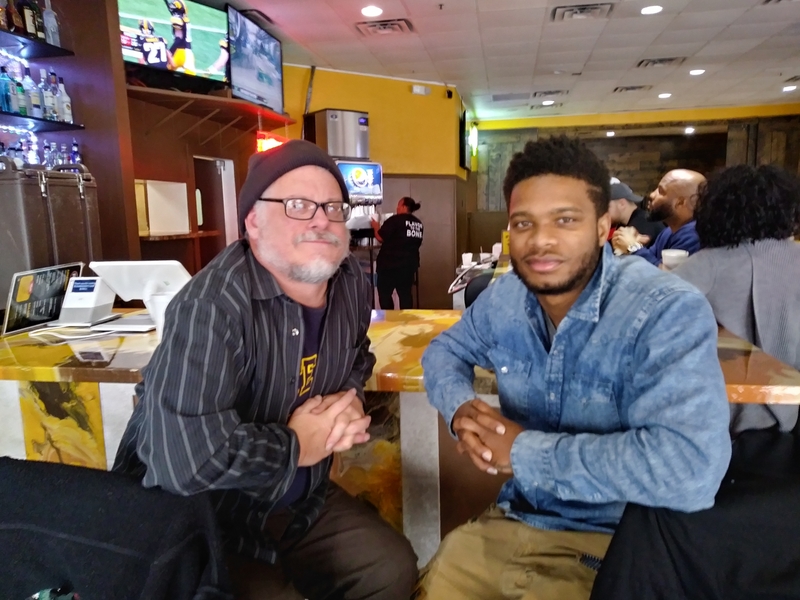 Discussed the lowdown in P’town with the artist who demanded everyone’s attention 5 years ago when his “Welcome to Peoria” grab-by-the-throat howl of protest & defiance & pain screamed up from forgotten streets of real people. The rap dropped in 2012 when he was based in Chicago. The iconic “Welcome to Peoria” video opens with Evolon at the Harrison Homes sign. Did you grow up there? “No. My sister. Well, I actually did live there for a little period of time. So (the video begins there) because I really wanna speak for the people that can’t speak. That don’t have the articulation abilities to speak — for their problems. An honest brilliant voice of his generation, Evolon & I talked for a couple hours in the spacious center city tavern-casual restaurant & sports bar which he claims easily has the best wings in town. Maushard & Evolon (right) at Rumberger's Wings in Peoria.